The ticker hit 00:00:00 and Valve delivered. The company powering Steam is out with another announcement today, revealing it's working with multiple partners to produce Steam Machines, a.k.a. gaming devices running SteamOS. "A powerful new category of living-room hardware is on the horizon" read the second special Steam page in as many days. Because entertainment isn't a one-size-fits-all proposition, Valve explained it wants consumers to "choose the hardware that makes sense" for them, hence its decision to work in conjunction with others to create a "variety of Steam gaming machines." These devices are due to hit the market in 2014. 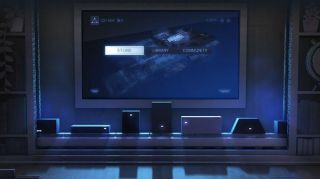 But before these SteamOS-powered products start whistling, Valve's own gaming machine, generally referred to as the Steam Box, continues to work through the prototype stage. Calling it a "high-performance prototype that's optimized for gaming, for the living room, and for Steam," Valve revealed a little more, though not much, about its hardware. "The specific machine we're testing is designed for users who want the most control possible over their hardware," it explained. "Other boxes will optimize for size, price, quietness or other factors." Valve promised to reveal specs, dimensions and even what it looks like soon, though it put out a friendly reminder that its Steam Box won't be the only box, meaning we're in for varying specs, prices and performance levels. And those machines won't just come from official partners - users will be able to create their own SteamOS boxes, plus hack, port, rework and reboot their boxes to their heart's content. Because real-world testing is vital to its Linux gaming endeavor, Valve is extending Steam Box prototype testing to Steam users, and will ship 300 boxes to them this year. A beta box will land on your doorstep free of charge if you're selected. Interested parties can join the candidate pool by completing the Eligibility Quest on Steam. The semi-epic undertaking (it's a bit more involved than filling out an application) must be completed before Oct. 25. "Your help is critical to our design process," Valve wrote. "Your feedback will shape both the new OS version of Steam and the new category of gaming machines that will run it." Look for plenty of info from these folks as Valve isn't discouraging public commentary during testing. In fact, it wants everything from bug reports to 3D prints to "very publicly stated opinions" to hit the airwaves. "We have some more to say very soon on the topic of input." Have questions about SteamOS? We've got you covered.